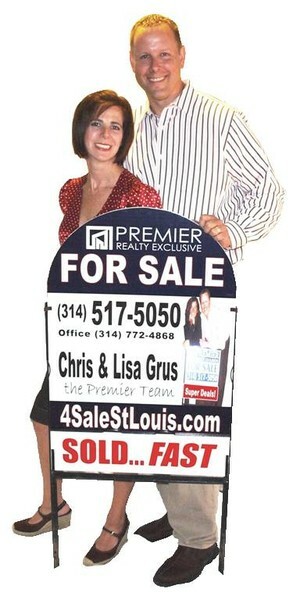 Chris and Lisa Grus started Premier Realty Exclusive in 2004 after having a difficult time finding honest, hard working, and Knowledgable St Louis Realtors to assist them in their real estate investment business. While their intention was to only represent themselves, they quickly found a market for what they had to offer to the St Louis real estate market. They ultimately chose assemble a solid team of real estate professionals dedicated to providing a higher standard of service to home buyer's and home seller's in St Louis. Founded in Manchester Missouri, the Premier Team works extensively throughout the region and enjoys working in diverse circumstances. Working in suburban single family homes seems to be the most basic form of real estate representation, they have taken a leading role in working with the specialty markets of condominiums, lofts, historic neighborhoods, and multifamily investments. The Premier Team also enjoys welcoming relocation buyers into the St Louis area and helping them find the perfect home, neighborhood and schools. They are presently located in the Tower Grove South Neighborhood and continue to work throughout St Louis. The Premier Team shares their personal experiences as former teachers, insurance professionals, home rehabbers, and landlords and a strong work ethic in their daily practice and look forward to serving you! If we can- WE DO! We empower buyers and sellers. We face challenges with Optimism and action.